Buhari signs Not-Too-Young-To-Run bill into law – Royal Times of Nigeria. 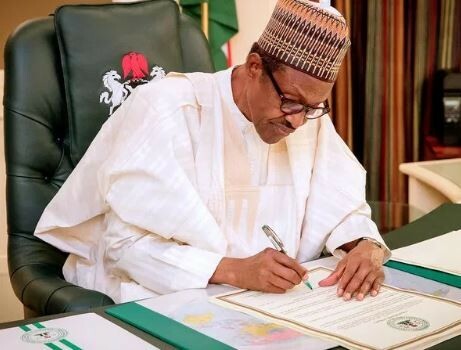 President Muhammadu Buhari on Thursday signed the Not-Too-Young-To-Run Bill into law. The law reduces the age qualification for president from 40 to 30; governor from 35 to 30; senator from 35 to 30; House of Representatives membership from 30 to 25 and State House of Assembly membership from 30 to 25. 1. First, I would like to welcome you all to the State House. Today is a significant day for all of us in Nigeria, and most especially our young people – and role they play in our democracy, politics and national life. 11. Thus, it may be tempting for you to think of this as the end of the journey. However, it is only the beginning; there is still a lot of work ahead, towards ensuring that young people take full advantage of the opportunities provided not only by this constitutional amendment, but also through Nigeria’s boundless prospects. 12. You should inculcate the spirit of self help. Those who complete their training should not just sit down and wait for government or private sector to employ them. You should be innovative and turn your hands to any legitimate work that will enable you to sustain yourself.